Governor Crist Visits New Airport – Called It "Awesome"
Florida Governor Charlie Crist visited the Panama City-Bay County International airport today and upon surveying the nearly completed site, said emphatically, “This is awesome.” With few invited to be in attendance, the energy was high in anticipation and excitement to see what the Governor thought of not only the newest airport in the state of Florida, but the first airport built from scratch in the USA in 14 years. Hosted by the Economic Development Alliance (EDA), the Govornor was invited to tour the new airport terminal and the Naval Surface Warfare Center. In attendance was Jerry Ray, Senior Vice President of Corporate Communication of St. Joe, Representative Jimmy Patronis, Representative Marti Coley, Airport Authority Chairman Joe Tannehill, Airport Authority Vice Chairman Bill Cramer, TDC CEO Dan Rowe, and various other local officials, board members and the like. Everyone was excited to show of the growing new addition to Panama City that will open in just 8 short months. The goal of today’s get together was to show the Govornor the “economic engine” that will not only catapult our little area to the big map, but also drive jobs and economic growth to Panama City Beach. Representative remarked today that he had “goosebumps” as he had not been up there since they broke ground. I’m sure it was an amazing sight to see having not been there for that long. I feel honored that the airport authority has been so gracious in allowing pcbdaily to cover the progress so closely. Sometimes it is easy to forget just how close we are to planes landing at the new airport. Today, Chairman Tannehill made mention to Crist that the airport will open May 18, 2010. 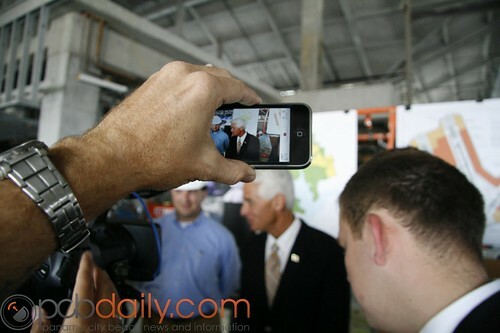 “I travel the state quite a bit and to see what’s happening in Bay County is nothing short of phenomenal,” remarked Gov. Crist. On a side note, I was able to get a little time with Chairman Tannehill, Board member Rick Koehnemann, and Jerry Ray and all three agreed that a new brand and name was needed for the new airport to depict a more regional presence. Chairman Tannehill said that this was something that would be discussed in the near future. Suggest your names in the comments section below! Previous Post Is the New PCB Airport Still on Schedule? Next Post Labor Day Weekend: Last of the Summer Wine? Ties the region to the state and the type of air service available (even if it’s via a connecting flight in Atlanta). by the way, its spelled “governor”. I am very excited about the many positive opportunities that may open up for our area & the community at large once the airport is open. However, I have some reservations of concern, as well as other business associates, about the operatioanal plans. If, we just move operations from the old airport to the new airport & do business as usual, aI am afraid, as well as others, all the hype & projected opportunities will either be very slow &/or non existance in developing. 2. No major low fare company has committed to bring in operations at this time = 8 to 10 months minimum if they were to commit today = approx Summer 2010. What does this all mean? Well I may be wrong in saying but from my point of view if we do not see some sort of deal &/or committment from a major low fare airline company within a month or two we are looking at another year just as before. I am sure & have full confidence in that the airport authority & all involved are doing there best to make things happen all in the best & most positive way. I just hope evertyone is being honest in keeping us aware of the good as well as the bad that may occur. My great expectation is to see Southwest Airlines become a major part of our new airport. talking with many of my clients I understand that this would change our area dramatically for the better. My great fear is that they have also looked at other locations along the Gulf Coast & have not committed at this time. Let’s do all we can together as a community to bring them to Panama City Beach! I hope “Northwest Florida” is not being considered for any part of the name of the new Airport. “North” gives the wrong impression (i.e. Cold). Gulf Coast International, Emerald Coast International — both sound equally great! For marketing purposes, the name needs a geographic reference such as these. As long as it does NOT get named (in whole or in part) after some politician or other public official! The south has a bad habit of doing that with public works projects, regardless of size. I’m for Gulf Coast International. It makes more sense to those not familiar with the area.